We have a celebration coming up in September! 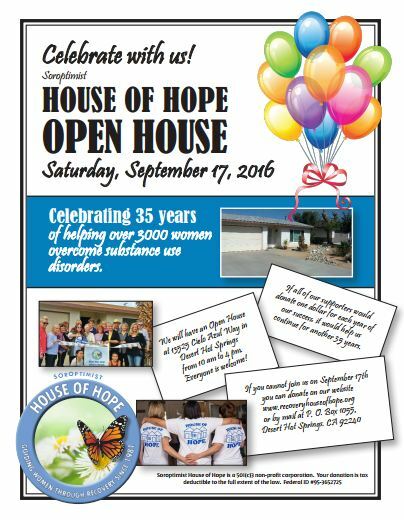 Soroptimist House of Hope was founded in 1981 so we are going to celebrate 35 successful years helping women recover from substance use disorders. Saturday, September 17, 2016 everyone is invited to our Open House from 10 am to 4 pm. We will have success stories to tell and tasty refreshments. Everyone is welcome at 13525 Cielo Azul Way in Desert Hot Springs. Bring a friend or two. If you cannot attend we will welcome your donation at P. O. Box 1055, Desert Hot Springs, CA 92240 or via our website at www.recoveryhouseofhope.org. How about one dollar for each year of our success?